In conclusion, there’s a lot to like – good speed, strong encryption and reliable app, but my big concerns (and your liability) is their logging policy. HideMyAss VPN service promises “total privacy and protection,” plus the latest-and-greatest OpenVPN protocol and encryption options. It claims to give you access to your favourite sites online (like Netflix?). Is it more like a proxy or a full blown VPN service? We’ll breakdown all the good (and bad) — from connections to network speeds and more — in this HideMyAss review. HideMyAss! (or HMA!) delivered consistent server speeds, delivers good device compatibility, along with A TON of servers. Check it out. HMA’s combined speed tests place them at number 20 out of 78 on our list. That doesn’t sound amazing, but there’s not a lot that separates the people at the top. We like to start by getting a baseline reading of our normal internet connection. At the time of this review, those benchmark speeds without a VPN were 97 Mbps download and 53 Mbps upload. Then, we connect to various VPN servers around the world, and use a reputable third-party tool (SpeedTest.net) to get current performance readings. These are pretty decent in reality. They’re not the fastest by any stretch. But the US, EU, and UK servers were all pretty consistent, which is a good indicator of overall performance across their other servers. Unfortunately, that Asia one tanked and dragged them down a bit. However, if you have a ~75% chance at getting the US, EU, or UK speeds, you’d be happy. HMA’s servers reach out across all six inhabited continents. That’s over 930 servers in 280 locations across 190 countries. They reach remote destinations like Greenland, cover Africa and the Middle East really well, plus a few in smaller Pacific Islands, too. It seems like the only place they don’t have a server is Antarctica. That’s significant, because many other VPN companies tout huge server lists, only to have them all highly concentrated in North America and Europe — leaving the rest of the world high and dry. Generally speaking, the more available servers, the better. Now, it’s not the end-all, be-all metric. Many VPN companies lie about their servers, in fact. They might lease or rent many of these servers from other companies, thereby ‘artificially’ boosting their total number. But overall, total size is a pretty good indicator for expected performance. It means your chances of finding a less-crowded server are better. As well as one closer to your physical location (which tend to be faster than ones further away). HideMyAss! has pre-built apps for Windows, Mac, iOS, Linux, and Android devices. It does not support TOR, however. The last time I reviewed HMA!, each account only allows for two different devices to be used at one time. This has changed now, and as at February 2019 you can use your HMA! account with up to 5 simultaneous devices. They also offer a business VPN plan for larger numbers of devices. But it’s also more expensive, too. Fortunately, HMA! works on routers, too. FlashRouters, in particular, have HMA pre-installed on them, so all you have to do is sign in. That means you can hook up a router, and then connect as many devices imaginable — including smart TVs and gaming consoles. You can protect all of these devices with OpenVPN (256-bit encryption), PPTP and L2TP/IPSec. It’s not the most extensive protocol list we’ve ever seen, but again, it covers the basics well. Most people should just stick with OpenVPN by default, anyway. Unless device limitations force them into L2TP/IPSec. And as a general rule, stay away from PPTP if you can help it. The HMA! app is really simple to use. Sign up for an account, grab your install files and authentication code, and you’re good to go. The app is even available in multiple languages, so you’ve got tons of potential options. Simply login with your access credentials, and you’re a click away from connecting. You can get connected instantly. Or, switch up your location and adjust settings. That’s about it! The app also has a built-in kill switch which helps with security. No complexity or technical skills required. One of the more user-friendly apps we’ve tested. VPN connections aren’t always as secure as they appear to be. The little green icon on your app looks good to go. But your ISP (and everyone else) can actually see where you’re sitting. We ran HMA! through a series of DNS and WebRTC leak tests to specifically look for this problem, and they came out clean in each one. Unfortunately, they did slightly let us down in the VirusTotal.com test. But let’s save that for the Cons below. HMA! delivers most of the features you’d be looking for. No issues or glaring holes there. Speed is pretty good. Tons of servers. Available for most devices. But it’s what’s under the hood that scares us a little bit. Read on to find out. A VPN protects you from the prying eyes of aggressive governments, ISPs, or hackers. But who, exactly, protects you from the VPN themselves? That’s the key question we’re trying to help you with in this review. 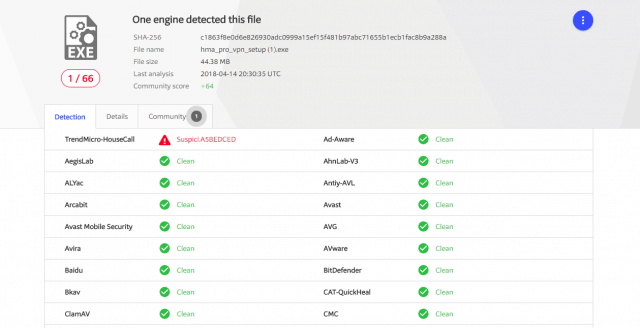 For starters, we take the installation files from every single VPN provider and run them through VirusTotal.com to double-check that they’re not inadvertently infecting your machine. HMA!’s files game back with a suspicious warning. This could be a false positive. However, you might want to test your own install files to make sure they’re clean before downloading to your device. It’s concerning to say the least. But unfortunately, it’s also just the beginning of a few warning signs. Here’s where HMA! lets us (and you) down. Already, that’s not good. 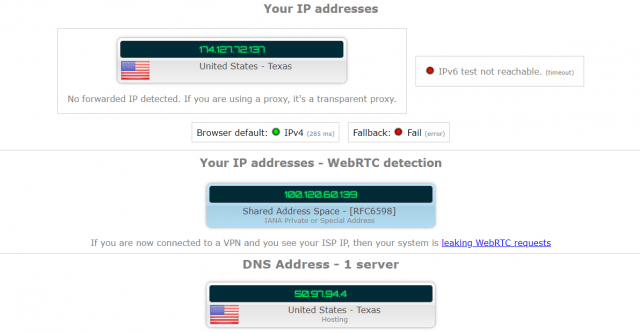 You don’t necessarily want your VPN to keep track of your own IP address. Because that still gives them a direct link between online activities and your location (and potentially your identity). prevent and detect abuse of the network, such as spamming, file sharing or other illicit activity. It does on the surface. However, when you take a few historical events into consideration, you can see where the warning spots start popping up. “Recursion” was the online name used by Cody Kretsinger, a hacker involved in the Sony Pictures hack of 2011. “Was” is the key word there. Because Cody’s now sitting in jail. For a very long time. HMA! handed his information over to the FBI, which was instrumental in Kretsinger’s conviction. HMA! did their best to justify their actions, but they haven’t managed to live down their reputation. Of course, we don’t condone using VPNs for illegal activity. But the fact that the VPN provider had information on Kretsinger’s activities and handed it over to law enforcement is worrying for many people. Especially when you take into account their jurisdiction. HMA! is owned by Privax Limited, a UK-based organization. First off, the UK is among the most aggressive when it comes to spying on their own citizens. But as a card-carrying member of the Five Eyes security alliance, it means they also have the help of other aggressive governments like the U.S.
You already saw why in the last point. When courts come calling, HMA! will hand over your data instantly. They also have a connection to your personal data. Other HMA! users have been complaining about having their accounts suspended for violating Digital Millennium Copyright Act (DMCA) statutes. HMA! is definitely logging your activity. They’re willingly sharing it with UK courts. And then those courts are turning around and sharing it with government agencies across the world. Avoiding any illegal activity while using HMA! is a good start. But it’s also not the point. Using a VPN isn’t about concealing illegal acts. It’s about keeping your private information private. And the evidence all says that HMA! fails miserably here. In this case, the VPN tasked to protect you is also the first one to turn you in. HideMyAss! was a very popular choice for streaming Netflix a few years ago. Unfortunately, that’s not the same case today. We were only able to get one server in Amsterdam to successfully stream content. The others we tried, including New York (U.S.), District of Columbia (U.S.), Montreal and Glasgow all failed miserably. Their site makes bold claims about unblocking content. However, the facts that we saw through actual tests debunk these claims. And while HMA doesn’t prohibit torrenting, they also aren’t exactly torrent-friendly, either. DMCA warnings haven’t added to anyone’s confidence level, either. If you’re getting a warning or an account suspension for violating copyright restrictions, it’s probably because of HMA!’s records of your torrenting activity. HideMyAss!’s support team is available on social media and email. (Though you’d think the above question would be a rather simple one to answer). We manually test each customer support department, too. Just to make sure you won’t be left high and dry when you run into an issue. So we fired off a short support question to HideMyAss!’s team. It took about a day to simply get a confirmation email. It wasn’t exactly a hard-hitting question or anything. I just asked about routers and protocols. Yet, all I’ve been met with since is radio silence. I even did a few manual inbox searches just to make sure I didn’t miss anything. HMA! has three individual price tiers. You get the same exact features with each one. The only difference is a slight price break for longer pre-payments. There is a 30-day free trial. You’ll need to enter a valid credit card or PayPal to take advantage. But they also provide a 30-day money-back guarantee, too. So that means you’re looking at ~60 days to test drive their service. That’s one of the best deals you’ll find. The only refund issues are that it has to be the first time you’ve purchased HideMyAss!, and you have to have used less than 10GB of bandwidth. You’ll have to fill out the refund request form. An annual commitment for $6.99/month is not the cheapest VPN out there. But the lengthy test drive period should be worth a few extra bucks. Speed and server numbers were respectable. Plus, they might have the best name of the lot. But in the end, the privacy concerns are just too overwhelming. We’re sure HideMyAss! wants to do the best they can in supporting their customers’ privacy. But combine their past logging activities, infamous court cases, and aggressive jurisdiction are just too much to overlook. Plus, this affects other activities you might be looking for, like Netflix or Torrenting. Both are basically nonexistent at the moment, and we don’t see that changing anytime soon. I’m all for catching cyber criminals. However, you’re paying a VPN for privacy at the end of the day. HMA! delivers a lot of things. But based on record after record that we’ve seen, privacy isn’t one of them. 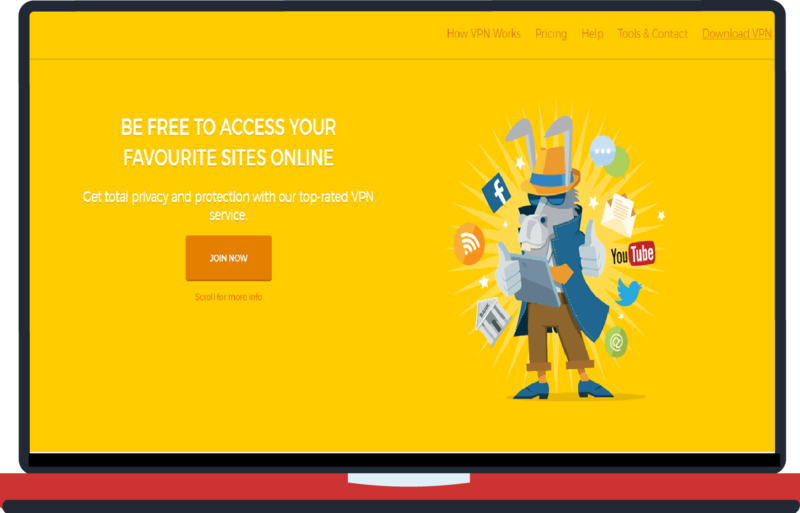 We’d recommend you look elsewhere for a better well-rounded VPN. 1. The claim you try the service for 30 days, but if you try to cancel they will deny you a refund you “due to MB usage”. HMA is not only one who has access to your usage records so how do you prove them wrong? 2. The service is spotty, sometimes it works ok, but most of the time it does not. 8. You can sometimes use with Netflix, I couldn’t consistently watch Netflix US content while outside the U.S.
9. I had a 1 year subscription and I complained and tried for a month to cancel it, they suggested ways to fix but it didn’t work… in the meanwhile, your MB usage keeps accumulating. They told me they could refund me a penny due to usage. I had to file a dispute with my bank to get some of my money back. At the end 2 months of service cost me $50. 11. One month they billed my card twice. 12. Do NOT buy their service and their billing department is awful. This one of the worst company I had to deal with in my life, just highway robbery! What is Happening with HMA? HMA used to be my goto app for vpn in the UAE. Alot has gone down the tube with this app, and here are a few issue I'm facing. 1. It's not connecting AT ALL not even for a second, it keeps trying "connecting" and NADA! 2. The app store seems to have removed it, or they simply didn't bother adding it to our store in the UAE. WTH?! 3. When attempting to connect the network protocol seems to redirect to an HMA username and not the one I have. 4. Support keeps sending links to things that they want us to use to "resolve" things, but they seem clueless that : If we are in a place that doesn't allow certain sites, how can we possibly access theirs? That is just scratching the surface. I really suggest that they get their dodoo sorted. Nord seems to be so stable and I would sign up to them if my money wasn't stuck with HMA for NO reason. Two issues with HMA. Firstly I received a cease and desist for P2P download I had run some weeks earlier, from a third party. This was early on and I was wary about the VPN - but I mainly used it for the BBC/ITV players and it wasn't about hiding my activities. I also after a year of paying month by month, I bought a 1 year subscription from one their promos. I then discovered they were also charging me for my monthly subs. Getting my money back was fairly ordinary. As soon as I disputed the monthly costs they suspended my account. In the end I got my monthly subs back, but lost the balance of the yearly sub - luckily it had been a good promo. I would stay clear. Since then I have used Cyberghost without issue. Money back guarantee doesn’t exist. I only used mine for 3 days but you so much as load an email and a webpage at the same time and you go over the MB limit to get your money back. Bad service, sneaky terms, connections are spotty and overall poor experience. Choose any other VPN service but this company. HMA! works as promised: no frills install of their Windows app, and a good diversity of exit points. Linux setup is not as easy as they promise (outdated software on their official site), although they do offer .ovpn files for OpenVPN setup, for each of their exits (both TCP and UDP). Speed is however inconsistent: using a popular exit point as UK, they vary between 5 and 20 Mbps, depending on the day of the week. I had used a free version of HideMyAss while first starting out and had upgraded to a paid version once I had tested out how reliable it was. There are many choices available in HideMyAss but the only problem is that they log your data and may close down your account for anything they deem as being suspicious, their commination via email and encryption is nice but it just doesn’t make it a good enough purchase when you know that they log everything about you. Long story short, I eventually cancelled my subscription to them after 3 brief months. I’ve been using this VPN for more than 6 months. My first impression was really good, it had a LOT of servers worldwide, where some countries had multiple servers, which was exactly what I needed back then. They advertise their modern version of the application, which I think is so bad and it provides 0 information, but I guess it’s ok for newbies, but honestly, I don’t think newbies are using VPN. They should advertise as full version and lite version, and not v3 for that lite app and v2 for the full app (it seems outdated when you say it’s an older version). Their v2 application is way better, but it took me a while to find it, I had to contact a support for it. Overall as just for changing the IP, it’s really good service, you have a lot of options, all the logs, a variety of servers. The bad thing about this VPN is torrenting isn’t going to work, which is not that good compared to the price you are paying for service. Also I think this is just my case, but still, I had an issue where my connection would drop randomly after equal interval of 20/30 mins, I think the problem was part of me, but still I contacted the support, and even though they were really fast and cooperative, they couldn’t find what the issue was. HideMyAss works well. The UI is fantastic and the service is fast, which would probably make it more appealing to users unfamiliar with VPNs. Unfortunately, the service is not without some significant downsides – it is expensive, at just under $10 per month if you go by the one-year package, and as much as $16 per month if you go one month at a time. Perhaps even more importantly is that it has logging policies that allow it to track some user data, which is a big no-no in a field that is meant to be all about anonymity. If you’re absolutely new to VPNs, the UI might make it worth it, but otherwise I’d suggest looking elsewhere. I’d recommending any VPN that keeps logs of their customers. They should be deleting them after very X minutes, but seems like HideMyAss has kept them for months (if not more). Bought a subscription from HideMyAss. They were alright and I used them for a bit, but forgot about my subscription and they billed me another year without giving me any notice (sending an email maybe???). Had a really long conversation with their support to get my money back and after five days of discussion I got my money back. HMA still good enough for me. 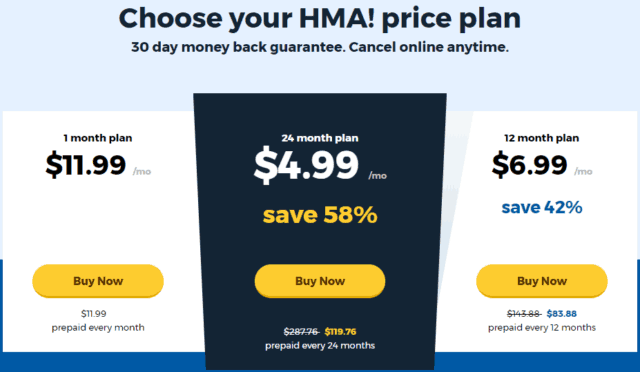 I’ve been using HMA for 5 years. I’ve never had any issues with them. For work, I have to travel a lot and keeping myself private is really important to me, HMA hasn’t let me down. As the previous review stated that some of the locations have been blocked, it’s not that important for me. They still have servers around the world which are good enough for a novice user as myself. Good provider! I had trouble using HMA in China in November. I went to a couple of provinces and HMA was blocked. I finally broke down and signed up for ExpressVPN and that solved all my problems. HMA was sympathetic and said they were working on a solution. From posts on forums, I understand this problem dates back to early 2016.